"Fryer's shining moment involves a mask that hides his face. His monument obscures him." -Playwright Ain Gordon, HSP's Embedded Artist. Dr. John Fryer, disguised as Dr. Anonymous, addressing the 1972 American Psychiatric Association annual meeting. Activists Frank Kameny and Barbara Gittings joined Fryer. Yesterday evening HSP welcomed the public for a sneak preview of an excerpt from playwright Ain Gordon's new play exploring the life and legacy of Dr. John Fryer, i.e. Dr. Anonymous, a nearly-forgotten pioneer of LGBT rights. Gordon, HSP's Embedded Artist, has been sifting, box by box, folder by folder through the 217 boxes of the Fryer papers. As he does, a new chapter in LGBT history has opened. “History cannot be the story of everything that happened, it’s not possible. Some things made it, and some things did not,” Gordon observes. The Fryer papers were some of those things that made it. But since the collection was donated to HSP in 2003 by Fryer’s sister, it has remained in the vaults, rarely unexplored. Until now. Gordon - whose previous work explores the ever-fine line between fact and fiction -has been stitching together a composite portrait of Fryer, drawing from the several hundred boxes of papers, photographs, and ephemera. The man that emerges from the 217 boxes is a conflicted, complicated - and sometimes cranky - reluctant revolutionary. So what makes Fryer's story worth exploring, worth transmitting? In Fryer’s lifetime, homosexual men and women were considered sick. This was not only the opinion of many Americans, but the official viewpoint of the American Psychiatric Association (APA), which deemed homosexuality a mental illness, “curable” through lobotomy and electro-shock therapy. Styling himself "Dr. Anonymous," Fryer donned a Richard Nixon mask, an oversized suit, and used a voice modulator to address the APA's 1972 annual meeting, denouncing the dubious "science" underpinning the medical profession's view of homosexuality. The next year, the APA’s classification of homosexuality as a mental illness was removed from the Diagnostic and Statistical Manual, resulting in "twenty million homosexuals instantly cured," as cheeky Philadelphia newspapers' headlines ran. 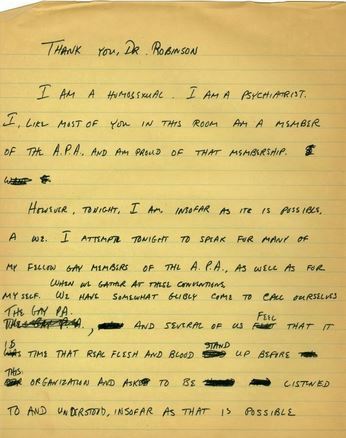 Image: Dr. Fryer’s notes for his address at the 1972 APA annual meeting, featured in HSP’s newest document display. Dr. Fryer does not cut an obvious revolutionary figure. Born in rural Kentucky and a dedicated choral director, Fryer risked his career and livelihood by speaking up - as a professor seeking tenure and a professional therapist a full calendar of patients. Indeed, Fryer risked his personal safety. The threat of physical violence lingered over homosexuals in Philadelphia as elsewhere. The police were often no help or, worse, the harassers themselves. What made this man, a professorial psychiatrist from the mid-west, decide to take a stand when no others would? Does Fryer’s early life offer any clues? How can we tell the story of a man from two hundred boxes of seemingly random papers, an “unintended self portrait”? Last night's discussion featuring Dr. Steven Sokoll (Clinical Associate Professor, University of Pennsylvania Perelman School of Medicine) and Lisa Nelson-Haynes (Associate Director at the Painted Bride Art Center) and Gordon sought to proffer "answers" to these questions. Ain Gordon, Dr. Steven Sokoll, and Lisa Nelson-Haynes discussing Fryer's life and legacy. The Artist Embedded project will continue through the premier of Gordon's play in May 2016 at the Painted Bride Arts Center in Philadelphia. The final public program will be held on March 30, 2016, with a look at the musical side of Fryer's life, including his decades spent as a choir director. When we look back, we cannot know ALL that happened. The historical record is rarely, if ever, complete. When we present history, we fill in the gaps, create the voices that spoke, the characters that lived. Are we creating fiction? Have we made history un-true? Or have we created a more layered truth greater than mere fact? 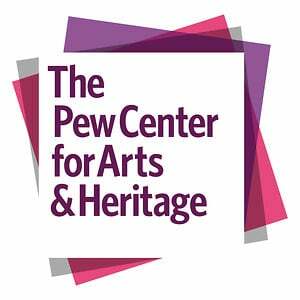 Obie award-winning playwright Ain Gordon and the Historical Society of Pennsylvania will explore the intersections of history and fiction, fact and truth, as part of a new two-year project, An Artist Embedded.